Created this trench vest out of an old jacket. Added the military snaps to the shoulders and got rid of the belt that came with it. Now it’s one of my favorite pieces. Paired with a layered ruffle blouse and bell bottoms. I love this look! I am especially in love with the pants! I am so happy to see people stepping away from skinny jeans for a bit! Great pants, and love all of the bracelets! I love the 70s inspiration here! Great outfit! Your bell bottoms are so cool! 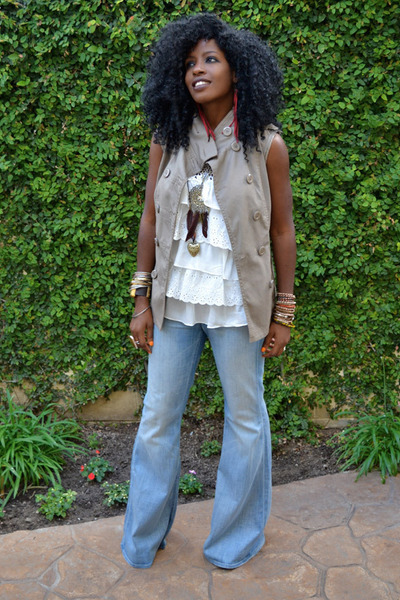 love this outfit.. especially love your diy vest! love this, your style is so unique! I am in love with your style! Love your creativity and how you created your trench vest!!!! Chic!!! !